On-demand booking platform for mini-trucks Moovo.in, owned and operated by OrbitNote Technologies Pvt. Ltd., has raised an undisclosed amount in seed funding from cricketer Yuvraj Singh's venture investment fund YouWeCan and a group of other individual angel investors, the company said in a statement. Investors participating in this round include Vikram Chachra (co-founder, Eight Innovate), Bijay Sahoo (president- HR Reliance Jio), Nitin Sethi (partner-consulting, India-Aon Hewitt), Sameer Nagpal (COO, Cocubes.com), Doshi Family (Doshi Diagnostics) along with two other IIT-alumni Pratyush Prasanna and Anindya Shuvra Sen.
Moovo was founded in December 2014 by Abhishek Anand and Anjani Kumar, alumnus of IIT BHU and IIT KGP, respectively, to simplify cargo logistics. Today, the startup has 18 people from IITs, IIM and IIIT in its core team. The company claims it is growing 100 per cent month-over-month and plans to expand to six other cities by this year end. 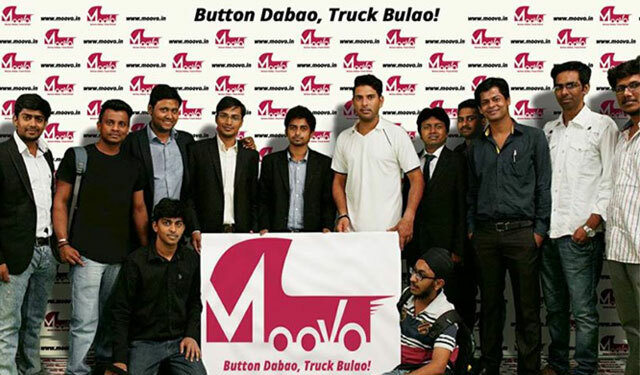 Users can book a truck in the Delhi-NCR region from the Moovo app, website and call centre. The startup is aggregating a fleet of trucks with verified drivers, who it claims will show up in under 30 minutes for pick-up. The venture idea was inspired by founder Kumar's personal experience in truck ownership during his college days. "While at IIT-KGP, I came up with the idea of buying a truck to run a side business and make some pocket money. However, I soon realised how difficult it was to generate business for a single truck owner and every day my truck sat idle, I would lose money. I learnt first-hand that market power in the logistics business comes from size and reach," Kumar said. He added that this triggered the idea for Moovo's asset light model of aggregating a large fleet of small truck owners on an on-demand tech platform. "We started the venture in December 2014 and we are processing over a thousand orders per month from consumers, small businesses and online retailers," he claimed. The firm estimates the market for mini-truck transportation in India to be around $6 billion annually, of which only about 3-5 per cent is organised. More than 90 per cent of the market is fragmented with a lot of small players consisting of single driver-owners resulting in a huge mismatch in supply and demand. "The entire logistics market is upwards of $130 billion. With the use of technology and smart algorithms, Moovo intends to revolutionise the logistics market in India. We want to disrupt the logistics sector, just like Ola and Uber disrupted the taxi market," said Anand, co-founder of Moovo. A bunch of tech startups have joined the business of connecting last mile logistics services providers for intra-city transport over the recent past. These ventures are asset light and do not own the vehicles themselves and come across as a booking platform similar to taxi hailing apps Ola and Uber. Indeed several have also raised angel or VC funding. Bangalore-based theKarrier raised Rs 1.5 crore ($240,000) in a seed round of funding led by early stage investment firm Sol Primero last month. OutBox Ventures and Nikunj Jain, founder of Frankly.me, also participated in the round. In April, Mumbai-based online logistics marketplace The Porter that enables booking of mini-trucks and tempos for intra-city pick-up and deliveries raised Rs 3 crore (just under $500,000) from Kae Capital. It is now raising a larger Series A funding round. More recently, Bangalore-based marketplace connecting users to last mile logistics service providers for intra-city deliveries LetsTransport.in, acquired Shifter, a similar venture which connects mini-truck owners earlier this month. According to market research firm Research and Markets, the Indian logistics industry is expected to grow at a CAGR of 12.17 per cent by 2020 driven by the growth in the manufacturing, retail, FMCG and e-commerce sectors. India's third-party logistics (3PL logistics) is expected to be worth $301.89 billion by 2020.